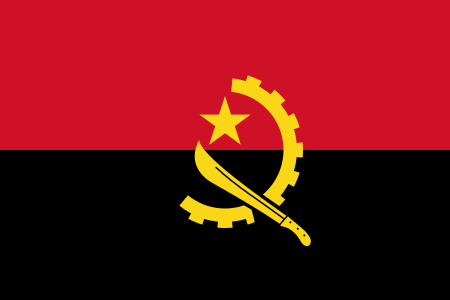 Angola is a large, developing country in south-west central Africa. The capital city is Luanda. Portuguese, the official language, is widely spoken throughout the count0ry. Despite its extensive oil and mineral reserves and arable land suitable for large-scale production of numerous crops, Angola has some of the world's lowest social development indicators. Development was severely restricted by a 27-year long civil war that broke out upon independence in 1975, which destroyed the majority of the country's infrastructure. Since the conflict's conclusion in 2002, the economy grew at double digit annual growth until the global financial crisis undercut oil revenue. Nevertheless, the government continues extensive infrastructure reconstruction and development projects. However, Angola still faces challenges with its infrastructure and with providing government services, especially in basic social services, aviation and travel safety, accommodation availability and quality, and communications. Facilities for tourism, particularly outside the capital of Luanda, are often rudimentary. TESOL Certification for Teaching English to Speakers of other Languages in Angola.